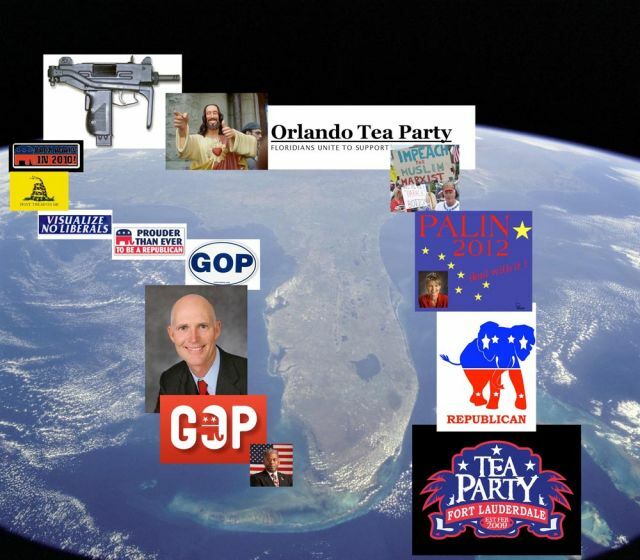 Florida Republicans Planning a Putsch? Photo illustration: To enlarge, <a href="https://motherjones.com/wp-content/uploads/images/whatsthematterwithflorida.preview.jpg">click here</a>. Over the next few weeks, yours truly is going to highlight the political sideshow that is the Sunshine State in a little feature I’d like to call “What’s the Matter With Florida?” From the new billionaire ex-CEO governor who can’t count or set a budget, to his regulatory logjamming and pro-corporate political appointments, to the GOP-run legislature’s fight against fair voter districting (2000 anyone? ), to statewide Republicans’ preoccupation with residents’ poop tanks—it’s a real-time lesson in what conservative-dominated governance looks like in America after George W. Bush. Screw the Fountain of Youth. Florida House Republicans have discovered something better in one of their smoky, hubris-filled back rooms: a hot-tub time machine. We’re hearing from a top Miami Republican lawmaker that Miami-Dade’s Republican delegation, the biggest in the state, voted as a bloc to make Rep. Richard Corcoran House Speaker in 2017-18. Though he’s a Suncoast guy, Corcoran had big Miami bonafides: He was the chief of staff to Miami’s only House Speaker, Marco Rubio, the current U.S. senator and Republican star. …from what the lawmakers and consultocracy are telling us, Corcoran is well on his way to succeeded Chris Dorworth who will succeed Will Weatherford who will succeed current House Speaker Dean Cannon. Wuzzat? You wanted to know how it’s possible that a political party already has its next four speakers of the 120-seat Florida House picked out, when voters have yet to go to the 2012, 2014, and 2016 polls and grant that party a majority of the seats? And you don’t buy the hot-tub thing? Yeah, but it’s a cushy institutional failure. Speaking of which: Corcoran also got $113,000 grand from Rubio’s political committee to write a book, 100 Innovative Ideas for Florida’s Future in Rubio’s name. Given Corcoran’s, um, anointment for eventual anointment today, we can assume he’s had a clairvoyant vision of Florida’s future for awhile. And we can assume something else, too: Respecting voters’ power and observing basic standards of ethical decency aren’t among the innovative ideas in his party’s book.